Lean pieces of meat are ok for dogs, and turkey is an especially good protein. Make sure it's boneless and skinless, and no fat or grizzle or sinew. Also, watch your seasoning. Thyme and sage are especially popular seasonings on roasted foods, but dogs should not eat them. The best thing to do is keep the seasoned pieces away from your pet. And again -- no bones! Now if you are not serving turkey, the same rules apply. Beef, chicken and fish are ok. Pork should only be given sparingly. When it comes to side dishes, you can't go wrong with vegetables for dogs. They are very good for them, packed with vitamins. Of course, we humans love to spoil our veggies with butter, seasoning, sugar, cream of mushroom soup (no mushrooms for dogs!) and fried onions. Sweet potatoes, squash and pumpkin make great side dishes for dogs and humans. But humans do have a tendency to load these with brown sugar, maple syrup, marshmallows, that sort of thing. Stick to cooking them simply. And when it comes to pumpkin, no pumpkin pie. Too much sugar. Watching the fat content is very important because it can cause an upset stomach, even pancreatitis. 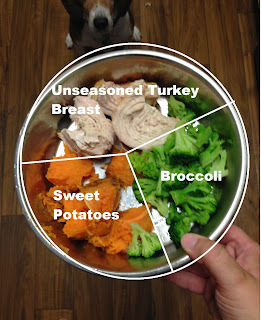 Also, always consider how this meal will fit into your dog's regular diet. Maybe give them less of their regular food, depending how much you decide to give them of the human food. But don't overdo it! This is meant to be a treat. Just consider this when your dog is sniffing around the kitchen, and Happy Thanksgiving! PS: Don't forget the kitty cat! Thanks for this! I'm heading to the store tonight to get our dinner. Thank you so much! Candy will have the best Thanksgiving ever! Happy Thanksgiving to you! Great post! Hopefully lots of folks will see this. I was reading in the newsletter from our pet insurance how so many dogs end up in the ER after T.g. from eating too many rich/bad foods! Yup! But we all know people can't resist sharing with their dog. My dad is notorious. The dogs all know too!